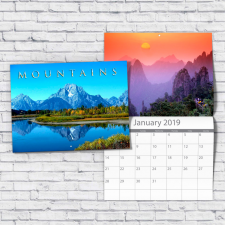 Calendar Printing - PrintFirm.com provides custom 2019 calendar printing service online. It's FAST and EASY. Order today and SAVE! A paper calendar is a classic item with artistic value that is important in this digital age. Paper items continue to be popular because people realize that not everything looks as good on an electronic screen. With calendar printing at PrintFirm, you can be certain of quality results at a reasonable cost. We carry two types of calendars, the wall calendar and the desk calendar. Our wall calendars are available in measurements of 8.5” X 11” and 9” X 12”. Cover options include our durable 14-point card stock with UV coating that protects against dirt and moisture and a non-UV coating with a matte appearance. You also have the option of a “self” cover that uses 100 lb. gloss text, the same material that the interior pages are made of. A hole punch is included for hanging the calendar at no extra charge. PrintFirm’s desk calendars measure 4” X 6”. They have the same card stock cover options as the wall calendar, but there is no “self” cover option. 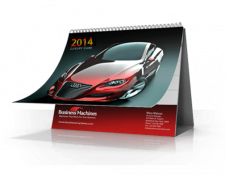 These calendars include a sturdy stand that is ideal for placing on any flat surface.